Who’s UP for an ALL-NIGHTERR!!! Okay everyone, it’s time for our annual All-Nighter! We will be meeting at St. Thomas’ Anglican Church (on the corner of Edward and Amelia St.) on November 12th at 6:30pm. The cost is only $20 and that covers the cost of 2 games of lazer tag, tokens for arcade games, and pizza. 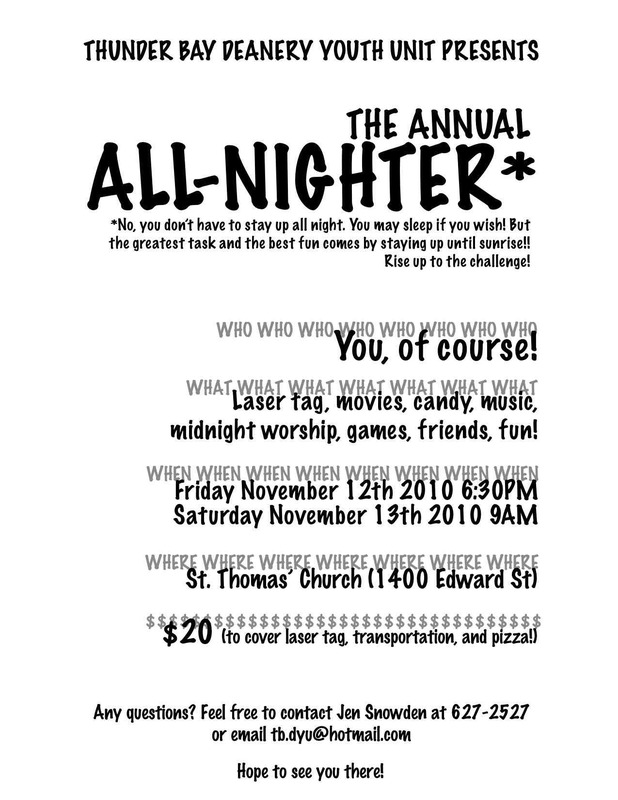 After lazer tag we will be heading back to the church for a mid night service and have fun for the rest of the night. Posted on November 10, 2010, in Uncategorized. Bookmark the permalink. Leave a comment.